It takes a LOT to pull me away from the greatness that is my First Aid Beauty Dual Repair Face Cream. I've been a fan of that moisturizer since the very beginning, and it just makes my skin look and feel so good. But ever since DDF Ultra Lite Oil Free Moisturizing Dew came into my life, it's definitely been giving my FAB tub a run for its money. Now, don't get me wrong. First Aid Beauty will always have a special place in my heart (and on my face). But this moisturizer has been making its way into my daily rotation as of late, mainly because it just makes my skin feel SO DARN GOOD. The formula is, as the name tells you, oil free. And because of this, it just glides right onto your skin and sinks right in without leaving behind any stickiness, greasiness or oily residue. One pump is enough to cover your face and neck (even when your skin is drier than the Sahara, as mine is wont to be during the cold winter months). My skin is incredibly sensitive and tends to freak out when I try new products, but from the first moment I tried this miracle worker, there was nothing but beauty left behind. The mix of aloe vera, grapeseed extract and Vitamins A, C and E combine to create a lush formula that just makes skin feel -- yes -- dewy. One thing's for certain. 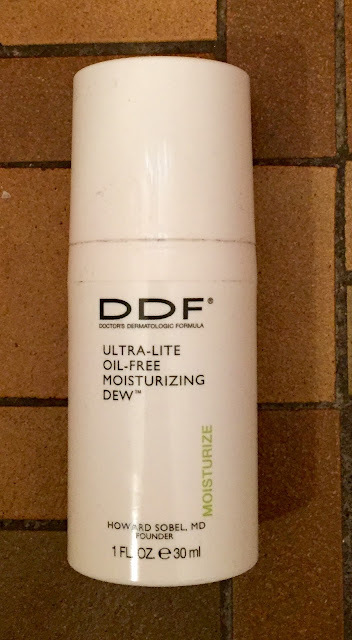 I "dew" believe in the power of this moisturizer. DDF Ultra Lite Oil Free Moisturizing Dew retails for $44 at beauty.com. My skin freaks too... it's awesome to hear that yours didn't with this! This sounds really great, and it's fantastic that it didn't bother your sensitive skin! My skin is super sensitive so the fact that it did not freak out on you makes me quite interested in this product.